Thread: Seve Ballesteros not well. The golfing world awaits the results of further tests on Seve Ballesteros which are being carried out at the La Paz Hospital in Madrid. It is feared that the 51-year-old Spaniard, who collapsed at Madrid’s Barajas Airport eight days ago after an epileptic fit, is suffering from a brain tumour. The golfer’s family have stopped taking phone calls and have asked the hospital not to give out any information beyond a statement. Neurologists had already carried out brain scans. “Everyone is worried that it could be something very bad,” said one of Ballesteros’ oldest friends. Last year Ballesteros turned up for the US Masters, a major he won twice, saying that his troublesome back was on the mend and that he was itching to play, not just that week but on the US Champions’ Tour for over-50s. Much to his chagrin, his golf did not match up to his heady expectations as he finished at the foot of the field both in the Masters and in his first senior sortie. As a three-times winner of the Open, he was among the past champions at Carnoustie last year. He explained that his main reason for coming was to refute rumours that he had attempted suicide. He said the reports were “not even close to reality”, and explained that he had been taken to hospital with a mild heart irregularity. Don't know, nor care who he is, but I wish him the best. Lat time he was here he took my son into the club house and he got to meet all the players (Westwood, Clarke, edfors, Karlsson, Stenson, Taworn, Thongchai etc) and even General Prem himself. One of the greats, erratic but played the sort of golf fans adore. The operation went well, but last night there was follow on surgery due to pressure in the skull. Is he a pattaya, sexpat? On his day probably the most gifted innovative golfer ever. Some of his "get out of trouble shots" were unbelievable and he could do it time and time again. Often wondered if he played with Garcia and Woods who the 'master' trickster would be. He was uncanny in the beach, he actually loved playing from the sand - figured he was the best at it and gave him an advantage. Seve Ballesteros's condition is worsening, according to the family of the Spanish golf legend. Ballesteros, 54, has had health problems since being diagnosed with a brain tumour in 2008 after losing consciousness at Madrid Airport. He had four operations to remove the tumour and reduce swelling in his skull as well as undergoing chemotherapy. The five-time major winner is being cared for at home in the northern Spanish town of Pedrena. A statement on his website said: "The family will provide information on his state of health when more news becomes available." They also expressed their thanks for the support they had received and added that any updates would be published on the website. He also enjoyed a successful Ryder Cup career as both player and captain - playing in eight Ryder Cups and winning 20 points from 37 matches before guiding Europe to victory over the United States at Valderrama in 1997. He appeared in public for the first time following the surgery in May 2009 when he went to watch his local football team Racing Santander and was given a standing ovation. He has called his battle against the tumour the "hardest challenge of my life." The former world number one golfer Severiano Ballesteros has died three years after surgery to remove a brain tumour. The 54-year-old passed away at his home in northern Spain this morning, according to Spanish television. His family had said on his website on Friday his condition had deteriorated badly. Ballesteros - who won five majors, including The Masters twice, during his 30-year professional career - had further treatment after the surgery rin 2008. 'Seve' Ballesteros was born in Pedrena, Spain, on April 9, 1957. 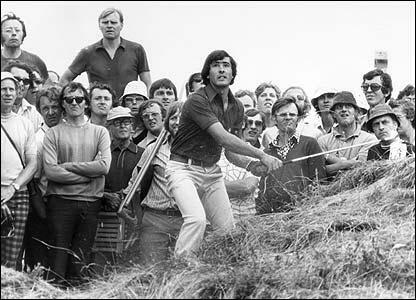 He turned pro at age 16 in 1974 and finished second at the British Open at age 19 in 1976. He went on to win the British Open three times in his career (1979, 1984, and 1988) and twice don the green jacket at Augusta (1980 and 1983). The former world No. 1 holds the record for the highest number of European Tour victories - 50. He won 87 titles altogether. One of the best ever match play competitors, Ballesteros helped Europe capture the Ryder Cup four times as a player and captained the team to victory in 1997. He was inducted into the World Golf Hall of Fame in 1999. Ballesteros played sparingly in the latter years of his career until his retirement in July 2007 due to chronic back problems. He underwent a 12-hour operation but further surgery was necessary before he was well enough to return home and begin chemotherapy and radiotherapy. Speaking afterwards, he said the tumour was "the size of two golf balls". Last edited by genghis61; 07-05-2011 at 12:58 PM. Damn. That is a real bummer. I loved the guy. I do not play or like to watch golf but i am aware of what a lovely man this was. As usual, the nice guys die before their time. My late mothers' favourite sportsman. Up there with the best, RIP.